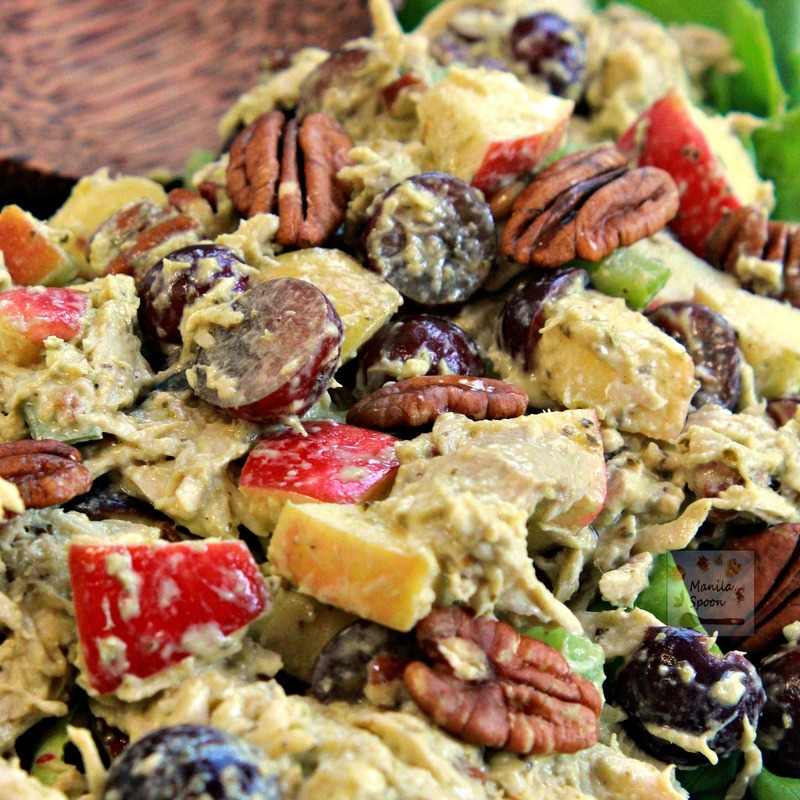 The perfect summer salad bursting with delicious sweet and savory flavors from apples and grapes, crunchy pecans and shredded chicken all smothered in creamy pesto mayo combo! Anyway, we’re back in business and I have a delicious salad for you all. The other day we went to Stew Leonard’s to buy some groceries as both our fridge and pantry were looking sad and empty. Hubby also wanted to get his favorite yucca bread from there which we found out upon arrival that they no longer sell as they weren’t in high demand. I have a feeling we were the only ones who bought the bread!! LOL. Seriously, it was sad that we lost our supplier of yucca bread! It was almost lunch time when we arrived there so we had a quick lunch and it was there where I spotted this delicious looking Pesto Chicken Salad!! I told myself, I would recreate it as I loved the flavor and the touch of green looked quite different from the usual pale white salad and it also looked very summery! So last weekend I set-off to re-create their yummy salad. This is not exactly the same as theirs because the store’s version was more savory while I decided to add here some touch of fruity goodness since we love adding fruits to our salad in the Philippines. I love the sweet and savory flavors that this salad brings to your tastebuds!! Can you see all that fruity deliciousness? Well, this salad didn’t disappoint – it was at once creamy, savory but with a touch of fruity sweetness from the apples and grapes and not to mention the extra crunch from pecans!! Hope you try this! To delete the photos for printing, click on the image box and tick the “remove” button. 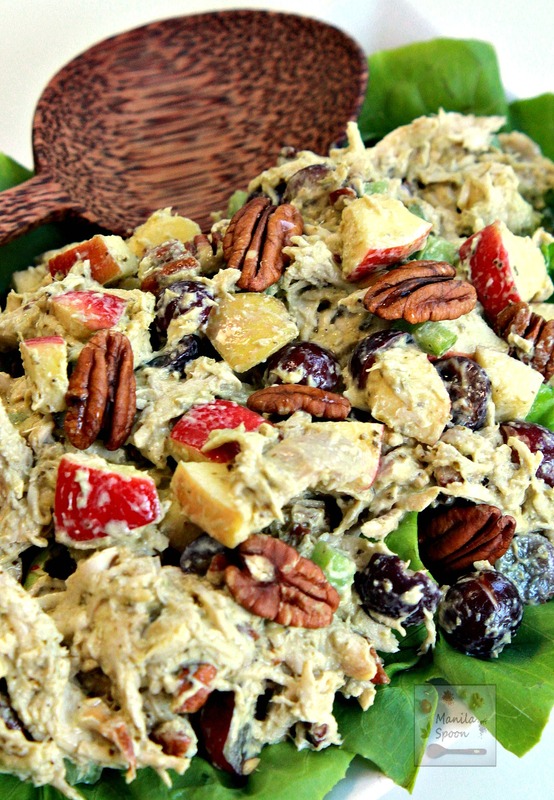 The perfect summer salad bursting with delicious sweet and savory flavors from apples and grapes, crunchy pecans and shredded chicken all smothered in creamy pesto mayo!! Place shredded chicken in a large bowl. Add the mayo, pesto, celery, pecans, apples and grapes. Mix everything. Taste and season with salt and pepper, as needed. 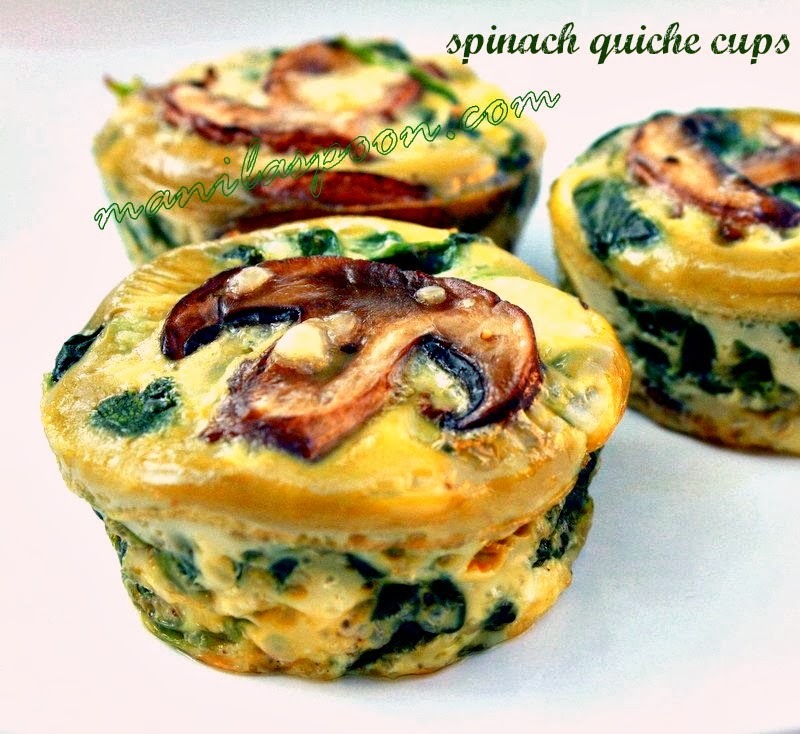 Refrigerate for several hours to allow flavors to blend. Just before serving squeeze some lemon juice to give it that fresh tang! Enjoy! I love this! It is almost similar as the Chicken Salad I get in Costco. Touring Europe is one of my bucket list next to RV'ing the entire USA. Hope you enjoyed your Europe trip. Thanks Shobee! Yes, we had a lovely time!